Your average American garage contents… probably two cars, a shovel, a rake, a hoe, and a lawn mower, mixed in with some bikes and sports equipment. My garage? No bikes, and for sports equipment I think I could find a Frisbee® if I could climb over the two electric chipper shredders and move the snow blower over a bit past the lawn cart and the wheelbarrow. I have to be careful, though, not to crash into my stash of clay pots. Let’s not talk about shovels, rakes, and hoes for the moment, they are on the other side of the garage anyway. Let’s focus instead on the lawn mowers. Yes, there’s a new mower in my garage, a Troy-Bilt B270 ES TriAction™ 21" Electric Start Self-Propelled Mower sent to me by Troy-Bilt to try out on my lawn. The mower was easy to get out of the box. Open top flaps of box, cut all four corners with razor knife so the sides of the box lay flat and wheel it out. It was easy to set up, too. Straighten handle, loosen two bolts, pull handle out eight inches, tighten bolts back down. Pull starter cord and hook onto handle. Add oil, add gas, turn key to electric starter. Engine starts, ready to mow. It took just 15 minutes or so to set up the mower, with no tools required. Somewhere in there I should have noted to review the owner’s manual. This is where the rubber meets the road, or we should say, the blade cuts the grass. Short version… once I made a few adjustments, this mower mows quite well. It is very easy to adjust the height of the mower deck to adjust the cutting length, and the heights are labeled “1, 2, 3, 4, 5, 6”, which I took to mean inches. So I started out at “3” and scalped the first section of lawn I tried to mow. I moved the two levers up to “5”, which seems to be a 3” cut. I measured to be sure because the owner’s manual didn’t seem to note that particular detail. The mower is self-propelled by the front wheels. My other gas powered mower is a self-pacing self-propelled mower so I was concerned that this one would be too fast or spin out of control in some sections. But it did neither. It moves at a very comfortable walking pace and I never felt it jerk forward, as some earlier self-propelled mowers seemed to do in the past. I did note that the handle is a bit higher than I am used to and isn't adjustable. But once I got used to it, I forgot about that, and think it made me stand up a little straigher while mowing. When I finished mowing, I didn't seem to be quite as worn out as with the self-paced mower, probably because I didn’t try to go faster than the walking speed. But overall, it took about the same amount of time to mow. The cut is good. I used the mower in “mulching mode” with no side discharge and no bagging (I never bag the grass as I cut it) and it did a nice job of cutting with no clumps of grass left behind. The second time I mowed with it, I put it through a serious work out. First, the grass was dampish in places since it had rained earlier in the morning, but it still cut well. This could be because of the “rake bumper” on the front that helps to separate the grass as you mow. Then when I finished mowing, I dropped the blade down and “short cut” the areas where I will have new garden beds. I do not recommend cutting a lawn that short, ever, and so question why lawn mower designers even make it possible to cut a lawn that short. But the lawn mower did well through this little exercise. I was cutting nearly two inches off, so at times it would start to clog up a bit, but occasionally lifting the mower slightly cleared out the grass clippings. A better option might have been to put the side discharge chute on. When I got this mower from Troy-Bilt to try out on my lawn, I assumed I would try it out, write the review and then look for a good home for it, as I wouldn’t want to give up my self-paced mower, plus I also have a delightful reel mower, plus I have a cheap push mower, plus I have… well, it isn't really all that relevant how many mowers I have. What's relevant is that I mow my own lawn, usually twice a week during "the season", and I've mown with all types of mowers, except a riding mower, and amongst all those I've used, this Troy-Bilt mower ranks pretty high as a good mower. 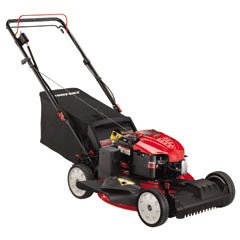 For more information on this mower and all the Troy-Bilt mowers, visit their website. With so little grass on my corner of Katy, a gas mower no longer makes sense for me. But if it did, this one sounds like a great choice! Thanks for the review. I hope someday my blog gets a big enough readership that I get sent free lawn mowers! I was thinking of you just now, Carol, as I came indoors from an hour of weeding ... in the pouring rain with an umbrella! Yes I am a member of that club! Interesting your mower review - we certainly need a decent one to cope with the grass after never ending storms (most unusual weather for here) - but I imagine that you will not have as much lawn to mow once your wonderful new beds are done. Happy mowing. Thanks for the review. I'll keep this in consideration. Tomorrow is my first ever Bloom Day! Can I post it now or do I have to wait till tomorrow? That makes me wish I had grass. We still have a gas mower but sometimes think about getting an electric one next time, Carol. Thanks for the review! I don't think you mentioned the sound ... is the Troybilt electric quieter than gas mowers? As to the height - I'm pretty sure anyone who grows bent grass keeps it cut very short (haven't grown it myself but saw it at son's house). A mower probably has to be able to cut anything from bent to bluegrass to fescue to St Augustine and Bermuda - all so different!